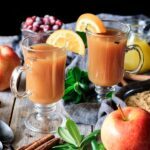 Festive wassail is a traditional homemade recipe that is perfect for Christmas or anytime in the winter. 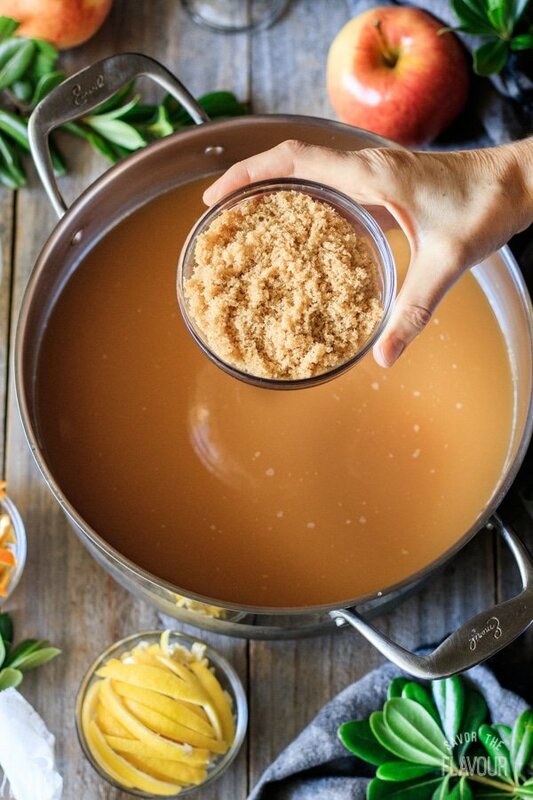 Use your crockpot or stovetop to make a big batch of nonalcoholic holiday party punch. Combine five fruit juices and the mulling spices, then let it simmer. Before you drink this piece of English history, toast to a healthy, happy holiday. This post was originally published on October 30, 2017. 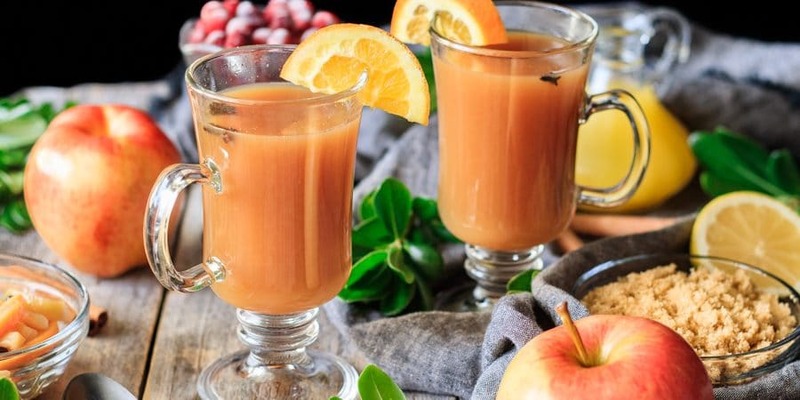 Wassail is an apple cider beverage with a strong citrus flavor.🍊 The first time I remember having this delightful holiday drink was at the annual Christmas celebration at Hofwyl-Broadfield Plantation. They made this British drink in a large cast iron pot hung over a fire. It smelled and tasted wonderful, so I was determined to make up a batch at home! It is an aromatic holiday beverage in the U.K, Canada, and the U.S.
Can be alcoholic or nonalcoholic. Comprised of apple cider, other juices, sugar, and mulling spices. What does wassail smell like? Aroma of mulled apple cider, citrus smells of orange and lemon, mixed with pineapple and cranberry. Spices of cinnamon, cloves and allspice. It makes your whole house smell like the holidays: an enticing scent. What is a wassail mix? It is a packet or sachet that consists of popular mulling spices used in wassail. The sachet is stored in an airtight container. Traditional mulling spices are: whole cloves, whole allspice berries, cinnamon sticks, dried orange and lemon peel, and possibly dried ginger slices or finely chopped candied ginger. Other mulling spices that could be in a mix would be: peppercorns, star anise, nutmeg, or cardamom pods. To use, you would stir the contents of the packet into your apple cider and fruit juices. Add some sugar. Stir and bring to a boil then simmer one minute. Remove from heat. Cover and let steep 15 minutes or until well flavored. 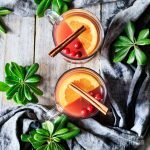 How can I make wassail for a holiday gift? 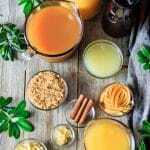 The most popular way is it make up wassail mixes using mulling spices and dried orange and lemon peels wrapped in cheesecloth, and stored in an airtight container. 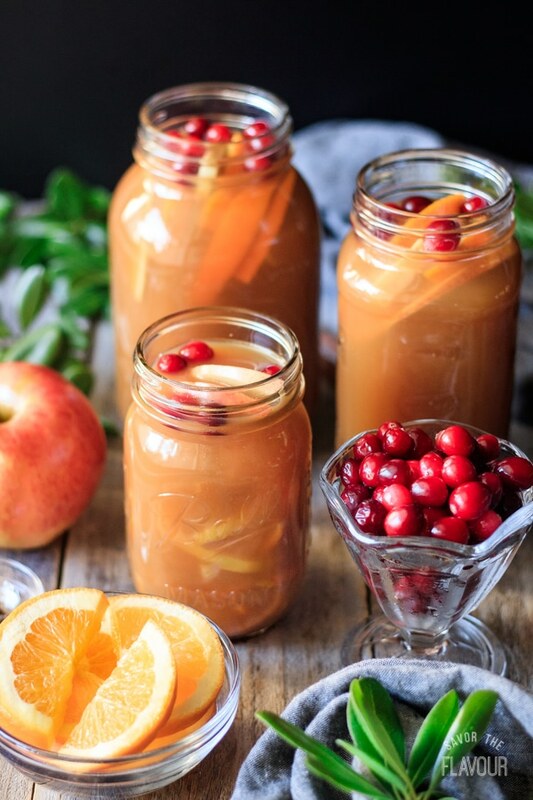 Pour your freshly made wassail into canning jars. Add slices of orange and apples with frozen cranberries. It will give it a Sangria like twist, without the wine. Allow the wassail to cool completely before screwing the lids on tightly. 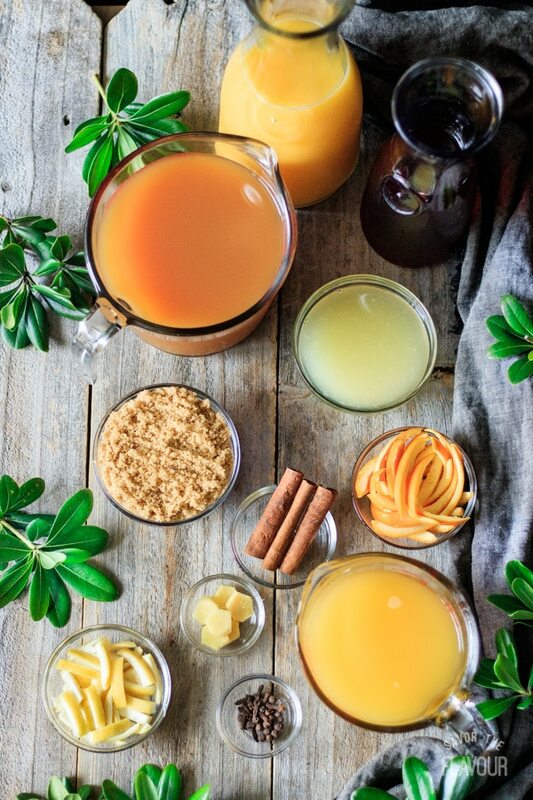 Start by gathering all the ingredients: fruit juices, brown sugar, fresh ginger, citrus peel, and mulling spices. For easy removal of the mulling spices, make a sachet using cheesecloth and kitchen twine. Cut a six inch square of double-layer cheesecloth and put the whole cloves and allspice berries in the center. Gather up the corners, twist, and tie with kitchen twine. 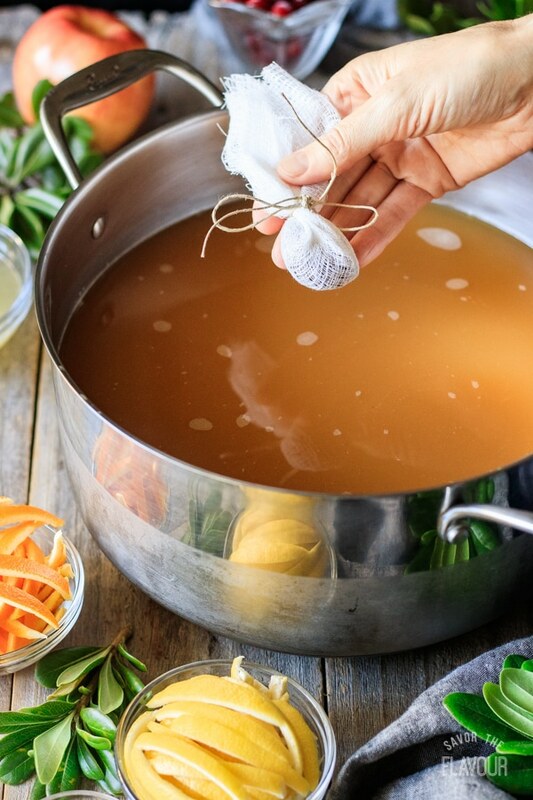 If you don’t have any cheesecloth, use a tea ball. Score the orange and lemons into sections, then peel. Pour the apple cider, orange, cranberry and pineapple juices into a large pot or crock pot and stir in the sweetener. For this recipe, I used brown sugar, but feel free to substitute with white sugar. Add the sachet (or tea ball) of the small mulling spices to the pot or crock pot. (If you don’t have cheesecloth or a tea ball, that is okay. Just add the mulling spices loose, and strain them out later.) For stovetop, cover and bring the pot to a boil; for crock pot, cook on high for 1 hour. Add the peeled and sliced fresh ginger. Pour in the freshly squeezed lemon juice. Add the other mulling spices: orange and lemon peel and cinnamon sticks. Stir, cover, and simmer for 1 hour. If using a crockpot, cook on high for 3 hours or on low for 6 hours. 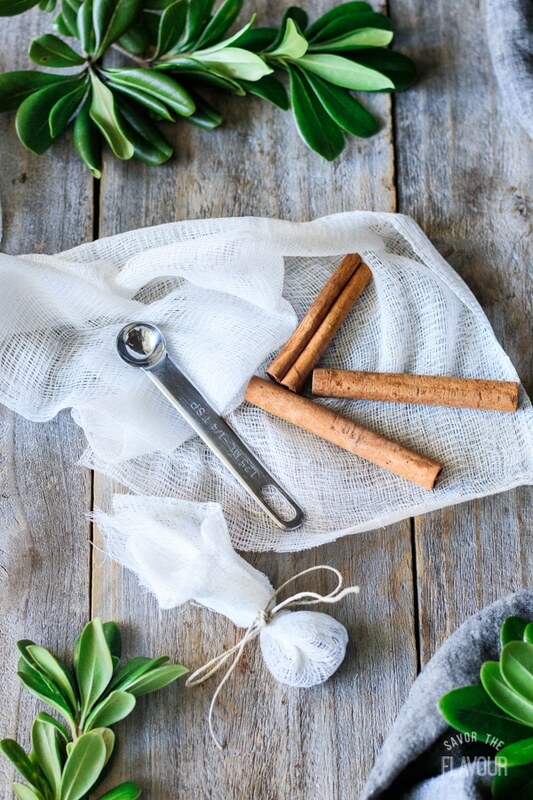 Remove the cinnamon sticks and mulling spice sachet from the pot or crock pot with a slotted spoon. If you are planning on serving this in a pot, keep the sliced peel and sliced ginger in the pot for added flavor. Keep the pot of wassail covered on low heat. Serve with a ladle. 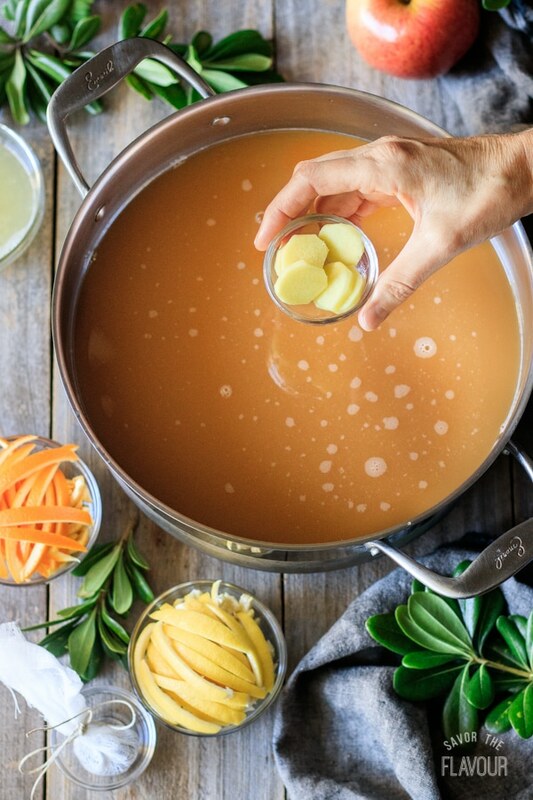 If you made this in a crock pot, or want to transfer it to a crock pot, strain the mulling spices, citrus peel, and sliced ginger by pouring it into a sieve that is set over a large bowl. Pour the strained wassail back into the crock pot. Keep the crock pot on the warm setting. 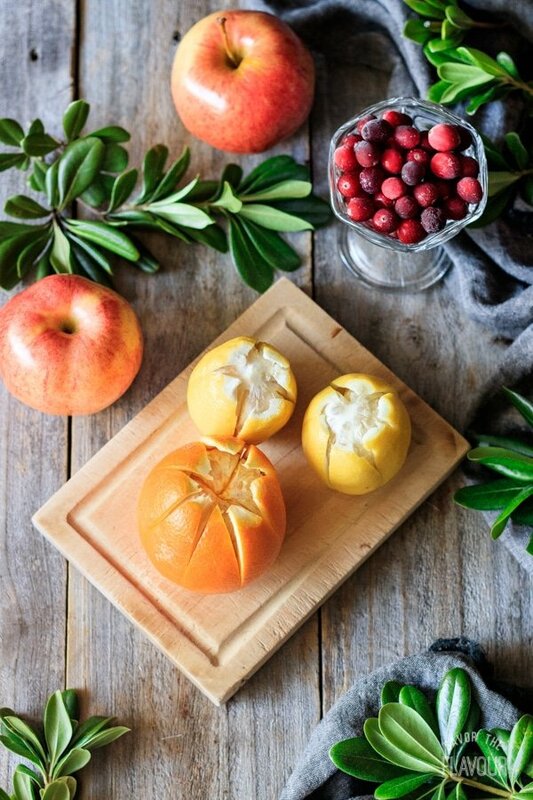 For garnish, add slices of apple and oranges and fresh or frozen cranberries. Keep the strained sliced ginger, oranges and lemon strips for snacking on, or add to your canning jars if making wassail for a gift. 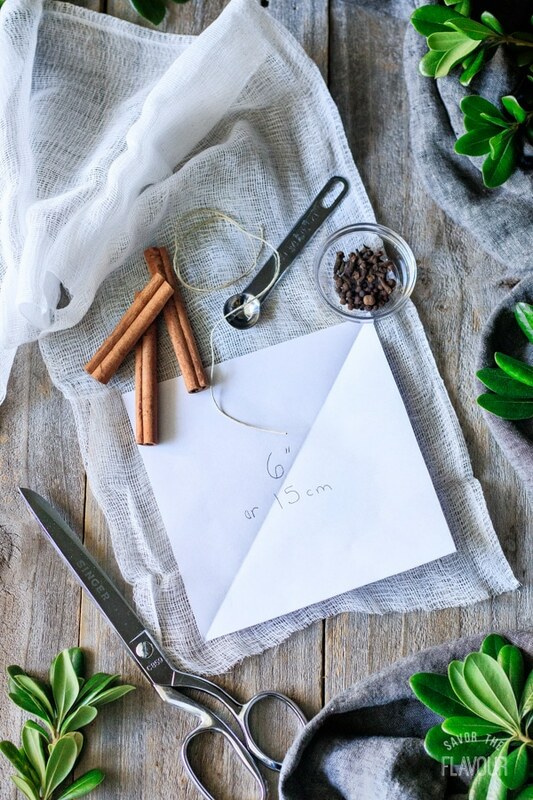 Make a spice bundle by wrapping the whole cloves and the all spice berries in cheesecloth. It makes for easy removal. Short on time? Leave the lemon and orange peels in larger sections instead of slicing to 1/4 inch pieces. 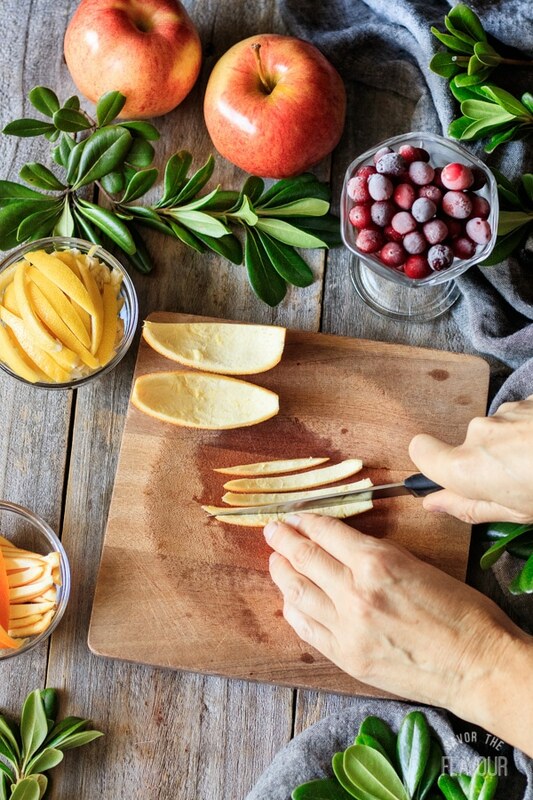 Change up the garnish with slices of orange, apple, lemon, cranberries, cinnamon sticks, or whole cloves. Transport the wassail in a carafe, crockpot (make sure it’s not too full! ), or large mason jars with lids on tight. Give wassail to friends and family. Pour the strained wassail into mason jars, stuff with orange and apple slices, and a few cranberries. Add a gift tag. Leftover juice? Freeze leftover cranberry, orange, apple cider and pineapple juice. Thaw and make another batch later. Can you freeze wassail? Yes, just freeze in an airtight container and leave about an inch of head space to allow for expansion. 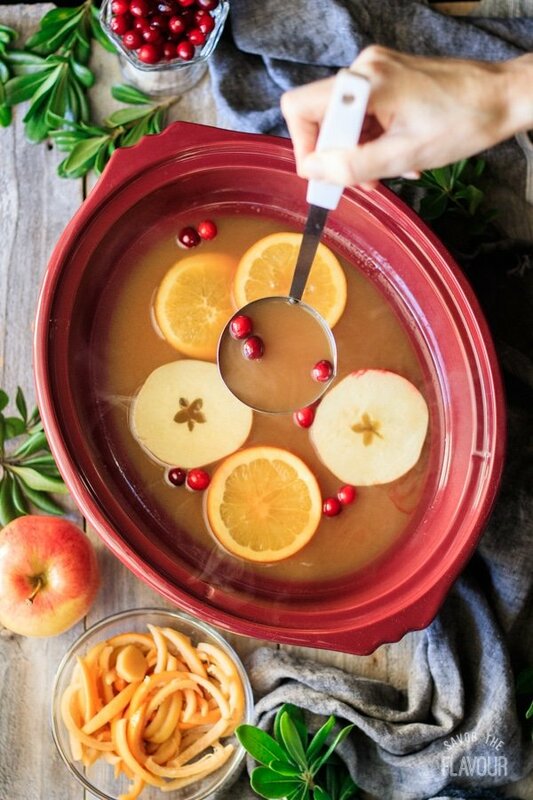 Keep your wassail hot for serving by using a crock pot, stove top, carafe, or warming plate. Make this ahead and reheat in the crock pot. Busy Baker 🍞 and I enjoy this delicious festive beverage even more than mulled apple cider! Why not make some tonight? Love warm holiday drinks? You’ll need to try these other ones. 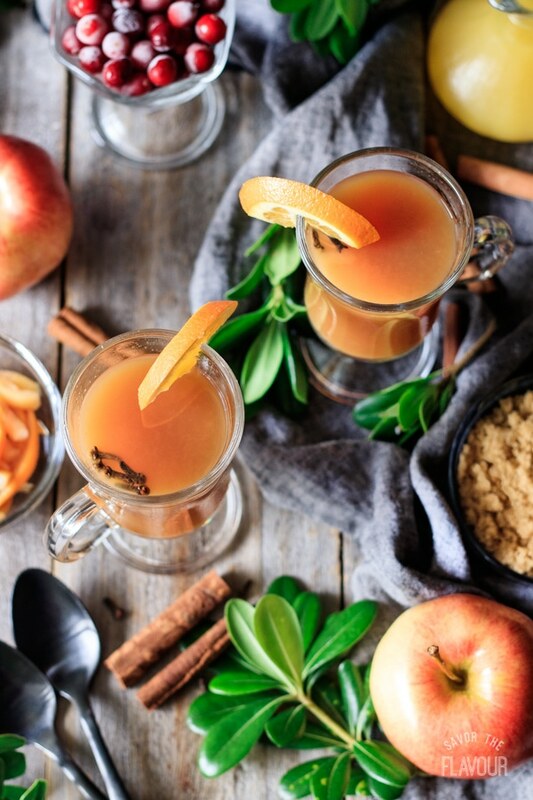 Mulled Apple Cider: this fragrant fall drink is very popular with young and old. 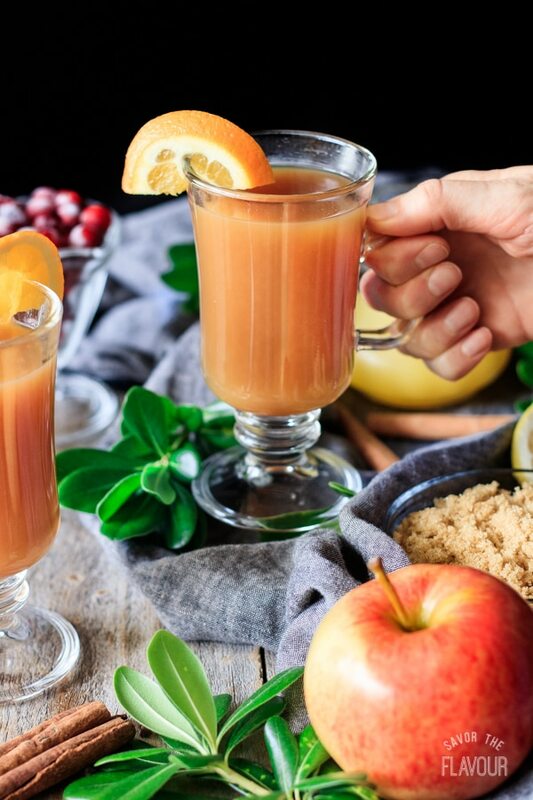 Mulled Cranberry Apple Cider: give mulled cider a festive twist with the cranberry flavor. Secret Ingredient Hot Chocolate: get cozy with this creamy chocolate drink. 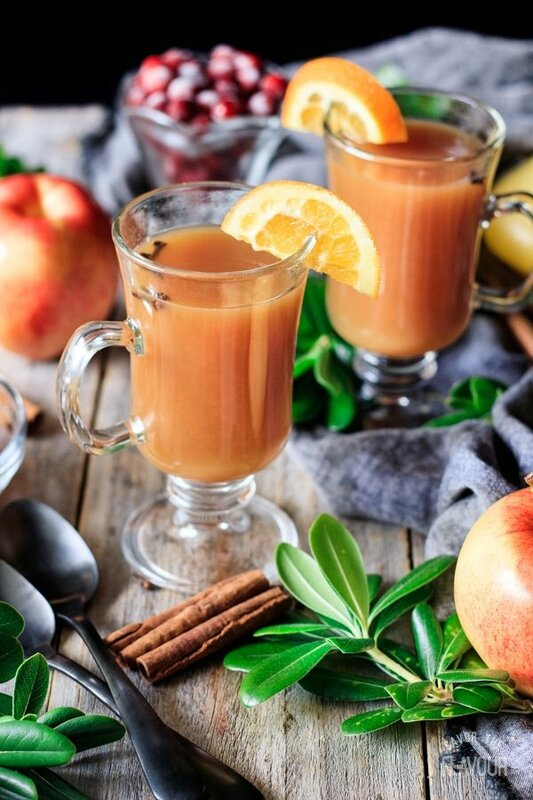 Did you make this wassail recipe? Please leave a star rating below the recipe to share how you enjoyed it. For easy removal, place the whole cloves and whole allspice berries in a double-layered square of cheesecloth. Tie with kitchen twine to make a spice sachet. 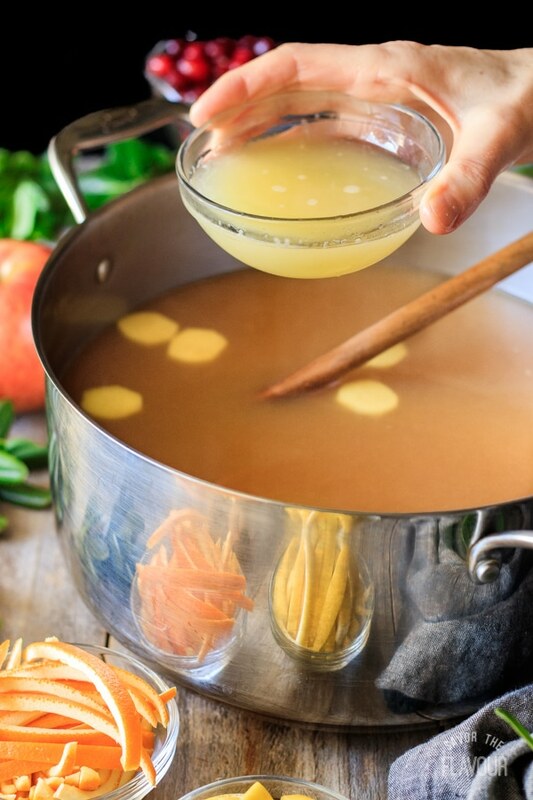 Pour the apple cider, orange juice, cranberry juice, and pineapple juice in a large pot, then add the brown sugar and spice sachet. Cover and bring the mixture to a boil. While the pot is coming to a boil, peel the ginger root by scraping it with the edge of a spoon and slice it into thin coins. Score the lemons and oranges in four to six sections, then peel, reserving the fruit for another use. Slice the peels into 1/4 or 1/8-inch strips. Squeeze the juice from 2 large room temperature lemons. Once the juice comes to a boil, turn the heat down to medium low. Stir in the ginger root, citrus peels, lemon juice, and cinnamon sticks. Cover and simmer for one hour. Remove the spice sachet and cinnamon sticks, as the flavor will be too strong if you leave them in for too long. (If you didn’t use a spice sachet, just pour the wassail through a sieve set over a large bowl.) 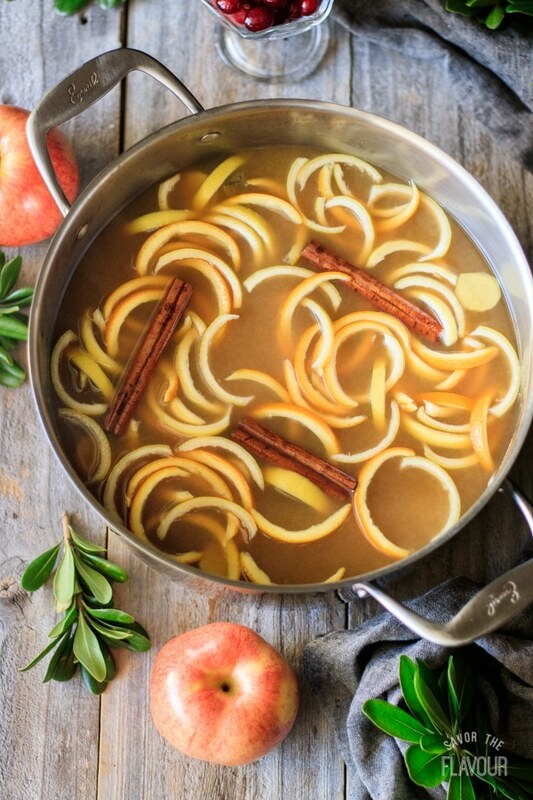 Add the citrus peels back to the wassail for color and flavor. If desired, garnish each cup with a half a slice of orange and a few whole cloves. Serve hot. Peel the ginger root by scraping it with the edge of a spoon, and slice it into thin coins. Score the lemons and oranges in four to six sections, then peel, reserving the fruit for another use. Slice the peels into 1/4 or 1/8-inch strips. Squeeze the juice from 2 large room temperature lemons. Add all the ingredients into the crockpot. Cover and cook on high for 3 hours, or on low for 6 hours. 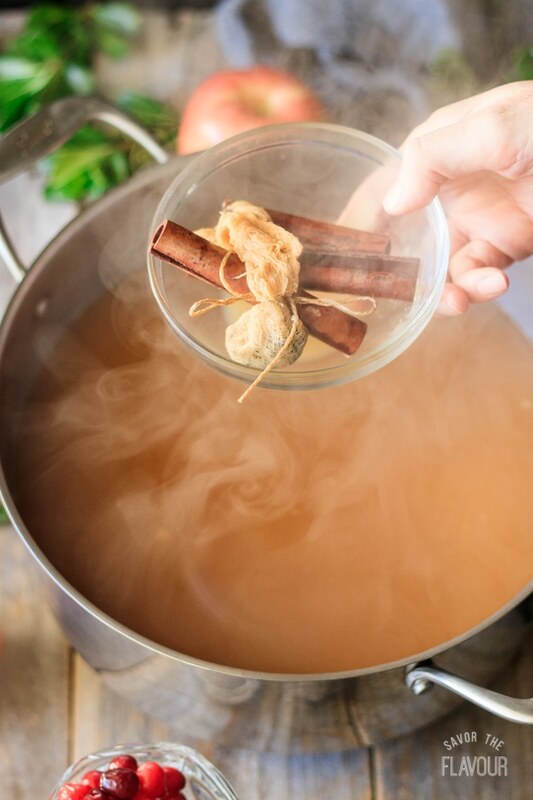 Remove the cinnamon sticks, citrus peel strips, and mulling spice bag with a slotted spoon or by pouring the wassail through a sieve set over a large bowl. Keep the citrus peel strips and discard the cinnamon sticks and mulling spice bag. Pour the strained wassail back into the crock pot. Garnish with three slices of orange and apple, and a few fresh or frozen cranberries. Cover and keep on warm. If desired, garnish each cup with half a slice of orange, apple, and a few cranberries. Serve hot. Any leftover wassail can be stored in an airtight container in the fridge for up to four days. Want to give some wassail as a gift? Pour the strained wassail into glass canning jars. Stuff slices of orange, apple, strips of citrus peel, and a few fresh or frozen cranberries into the jars. Seal with the lid. Add a gift tag.